20+ Ways to Have a Little Fun with Your Inner Child or Make Some Time for YOU! “Everything seemed possible, when I looked through the eyes of a child. Why not take your inner child on an outing for a day? Go solo to a park, sit with a good book for awhile and savor the quietness of the world...make sure to pick a bench that is far away from a baseball field and such. Schedule a facial or massage to unwind and just savor the moment...Hand and Stone has introductory offers for about $50/hour....just don't let yourself get talked into the package or do and have one every month...like a massage/facial membership. Take an early morning walk at a slow pace focusing on your breathing so there will not be any intruding thoughts of school or life...enjoy the presence of this moment, this second and calm your mind. There are so many wonderful inspirational ideas that make so much sense that can be learned from reading children's literature! Bring out your inner child for a day and sit down to reread your favorite children's book! I bet you will look at the world from a different perspective! 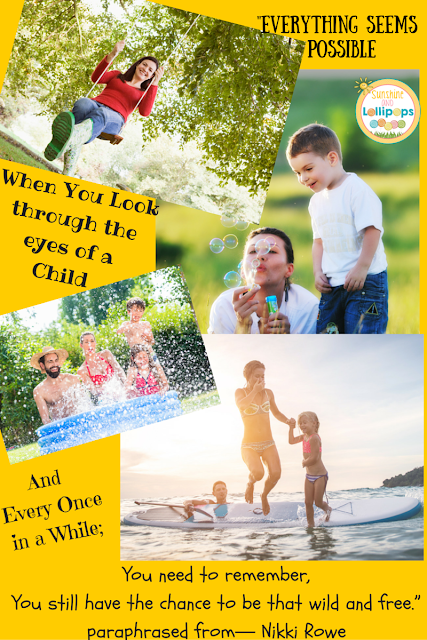 Go to a park and swing or slide for awhile (Recess is a great time to show your students you are really just like them...I used to LOVE to jump rope (of course as I got older, each jump was a little bit harder on my bladder and more difficult! LOL) play hand games (they LOVED the old fashioned ones I remembered from my day). When I ran around the playground with my kiddos not only did I squeeze in a little exercise, but also this activity made my class giggle and smile! During the summer these ideas above can be done with your own kiddos. Put the cell phone away...leave it in the car or turn it off and have some fun at the park with your own little ones...believe this time will pass quickly...make memories...they DO remember!!! Oh...and don't forget to bring the wax paper so the slide is FAAAAASSSSSTTTT! Read aloud your favorite children's book to your class, child or grandchild and have them pick a quote from it and expand and say what meaning it has for them. Post a Quote a Day in your classroom or on the refrigerator that came from a children's book you loved and maybe still love and suggest your class or child read this book! You will have the benefit of seeing that quote everyday to encourage your spirit. Draw on the sidewalk with chalk...YES YOU by yourself or with your class or children! A quote on the sidewalk for passersby might just make their day!!! Watch some of you favorite TV shows from years gone by at home with your kiddos and chat about how things are the same and different from what is on TV today! Run outside on a rainy day and jump in puddles or just walk in the rain without an umbrella...make sure it is just raining...no thunder or lightning just sayin'. Build a sandcastle if you are near a beach or play with kinetic sand and build whatever suits your mood! Walk barefoot through the grass or on the beach and feel summer...remember how free you felt as a child...bring back that feeling! Swim in the ocean...jump in the pool, swim and feel the ocean breeze or glistening sunlight on your face. Take a walk in the woods and stop for a few seconds to listen to the sounds of nature. Go to a trampoline park and jump solo or with your kids. Walk the beach or pretend your walking the beach and visualize what you see, hear and smell. Take the time to finish something you started a while back and never completed it...that children's book you are writing or the craft you never seemed to have time to finish! Go by yourself to a movie that you have wanted to see! Go out to lunch alone without your phone a bring that book you haven't had a chance to read! Do anything that allows your playful childlike side to emerge from the deep, dark crevices of age! Do whatever it takes to have some childlike fun...you won't be sorry! PS. Here are 2 of my favorite books from when I was a child. 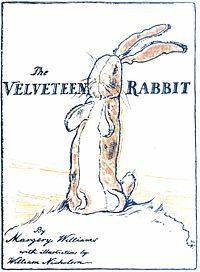 The Velveteen Rabbit by Margery Williams...I read this story to all my children as they grew up! We often had great discussions about the topic of being real. As one quote from the book says, " Real isn't how you were made," said the Skin Horse. It's a thing that happens to you. When a child loves you for a long, long time not just to play with, but REALLY loves you, then you become REAL. "Does it hurt?" asked the Velveteen Rabbit. "Sometimes said the Skin Horse, for he was always truthful. "When you are Real you don't mind being hurt." 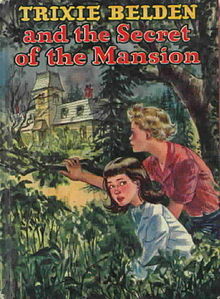 Trixie Belden Mystery Series by Julie Campbell Tatham I mention this series because one summer the summer of 1961, I spent the entire summer reading every book in this series! These books are what hooked me onto reading. Before that I was in the "crows" reading group and of course I knew that the "Cardinals" were top notch in the class! However I was obsessed with these books and couldn't wait to read more and more. i remember being so disappointed when I read my last and final book in the series! These books were out of print from 1986-2003...I had no idea the early books were reprinted by Random House! Think I will go on Amazon and get one to bring out my inner child ( 5th grade inner child!). A webpage all about Trixie Belden...WHO KNEW? I WOULD LOVE TO HEAR WHAT BOOKS YOU FAVORED AS A CHILD...comment below! LOVE IT! Swing and Slide, too!